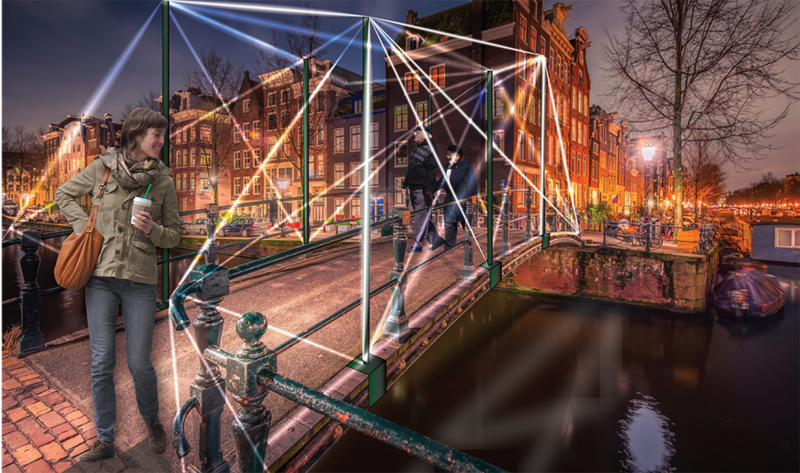 The intention of the Light Bridge is to inspire people to make new connections and feel the beauty of being together. 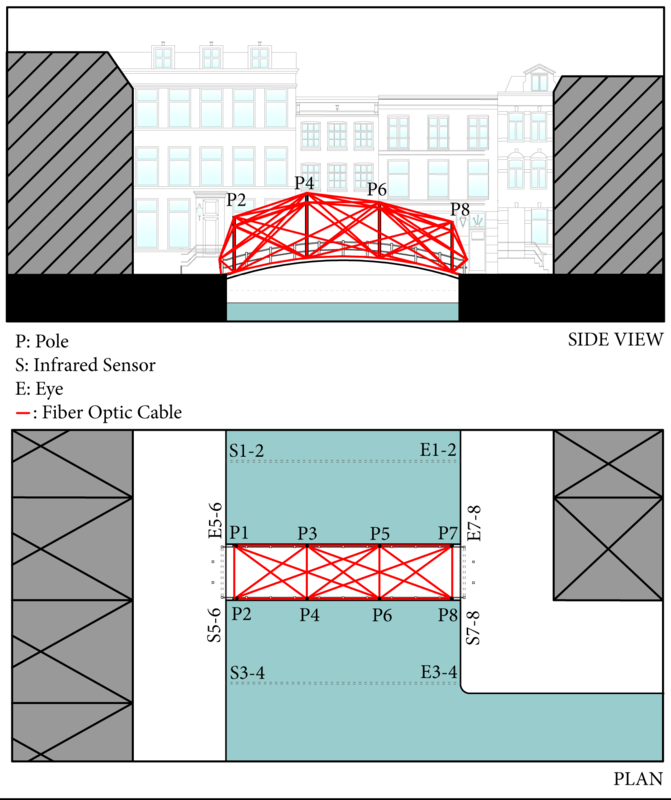 The design consists of very light fiber optic cables which are carried by demountable steel poles on Melkmeisjesbrug. The sensors (S5-6, S7-8) located at the both ends of the bridge will activate 5 fibers for the first person which are not static but continuously moving/flowing around the bridge. The number of fiber in light will increase or decrease with the number of people on the bridge. The cables will be applied also underneath of the bridge to involve people in the boats and to create reflection on the water. A passing boat between S1-2 and S3-4 sensors will change the color of the light till it is deactivated by being outside of the sensor line. It needs at least one person on the bridge to start the outstanding movement of light around the bridge which makes visitors stay longer on the bridge and recognize the change of intensity with the number of people on the bridge. With the arrival of a canal boat, the colorless light would change color and empowers the idea of coming together even more. 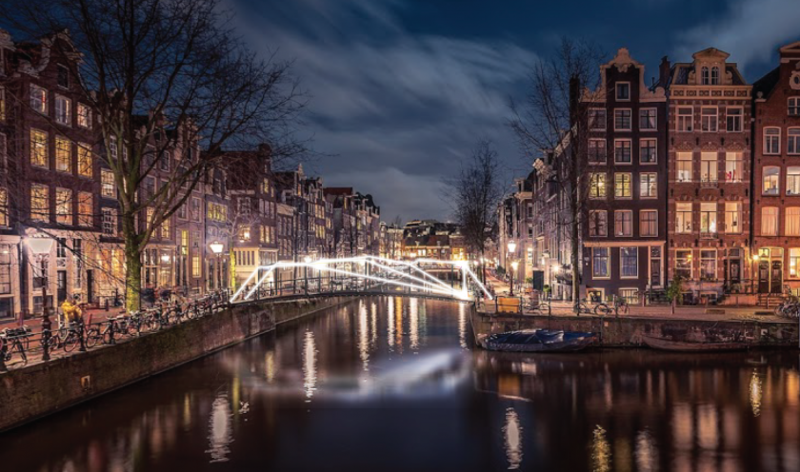 The light flow in the design, change of color with each passing boat and reflection of the bridge on the water would make people change their path and experience being surrounded by the installation. -The installation is proposed to represent Turkey where is a bridge country between east and west, Asia and Europe. -Making bridges is crucial to exchange ideas, and to know different perspectives. You have to be friends to bring two sides together. -This installation expresses the beauty/power of coming together to change our environment and make new connections. INFRARED SENSOR&EYE: Two sensors 10cm apart from each other will receive the direction of the visitors. If there is a movement through the bridge then an activity will start and keep going on till it is deactivated with the opposite movement (min 8 sensors are needed).